Regular Tarot Bags - Smooches Regular Tarot Bag - Tarot Bags, Tarot Cards, Cloths, & More! With kisses planted all across this black cotton fabric, this Smooches Tarot Bag represents LOVE in all its aspects! This bag is the perfect home for a deck that is especially revealing when it comes to readings on the topic of romance. Past customers have purchased this bag for the Tarot of Love by Marcia Perry or the Love Tarot by Bartlett and Tolford. Some customers also use the Smooches Bag to hold amulets, to enclose a love spell kit inside, or for a rose quartz rune set. 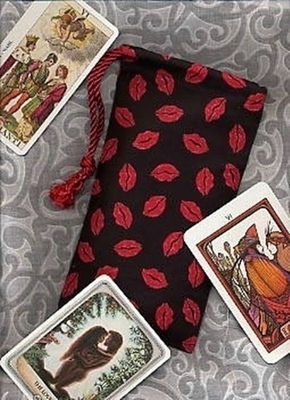 Naturally, the Tarot of Sexual Magic is perfectly paired with our Smooches tarot bag with lips and kisses all over it. Size: This bag is slightly narrower than most of our regular bags, but still holds cards as wide as the Aquarian Tarot. It measures approx 4.5" wide by 8" tall (about 11.4 cm x 20 cm). Fits standard tarot card decks (3" x 5" or smaller).